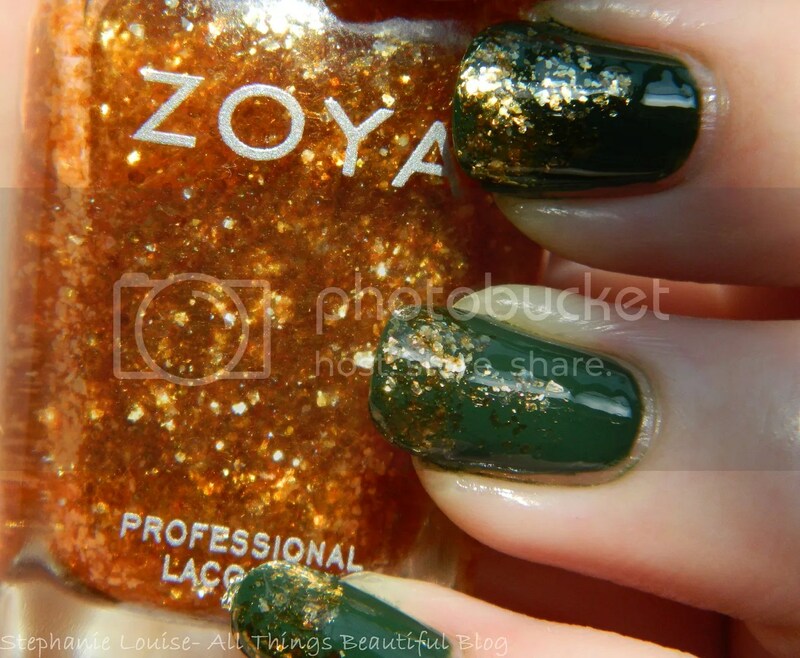 Zoya made a big splash with their Zoya Fall 2013 Pixie Dusts (see them all here!) which I absolutely am in love with but their Satin & Cashmere (up now, check them out!) collections are fabulous as well. Today I’m showing you my review & swatches of the Satin collection which contains 5 metallics & a special edition gold glitter topper. You’re going to love them! Keep reading to see swatches & review! I used a topcoat for all of the shades…purely out of habit. I actually think these were stunning without. They all had nice formulas for me but I’ll dive into that more below. Please keep in mind anything you want to see compared, I’ll be doing a post comparing these shades & the Cashmere collection as well! I added Zoya’s shade descriptions in italics & my own below. 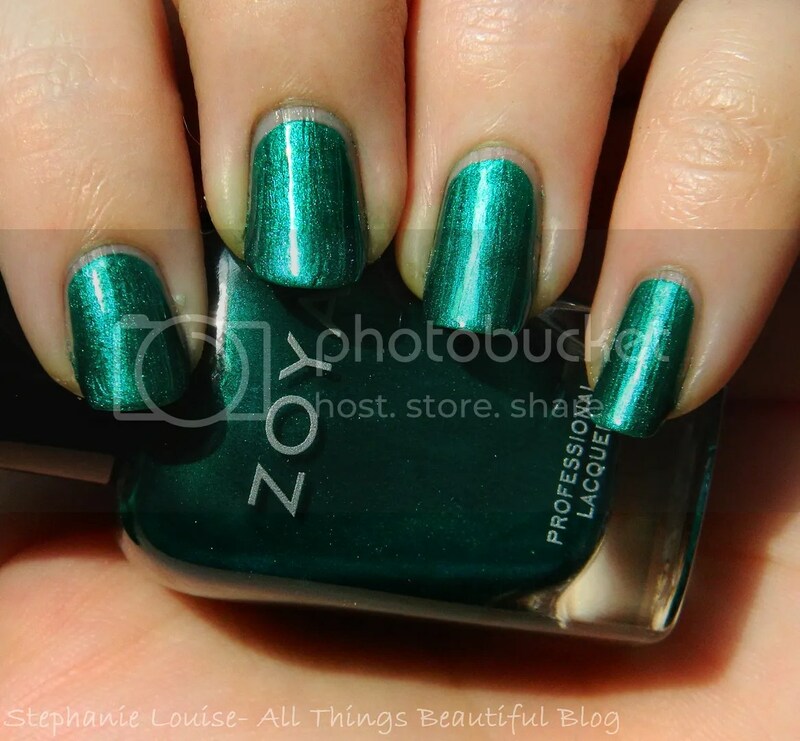 Zoya Giovanna- a stunning emerald green metallic. 2 coats. This is a glowy, metallic emerald green with slight turquoise tones. I love it. You need to be careful with application or else it will get streaky, go with 3 if you have any problems. I personally didn’t! 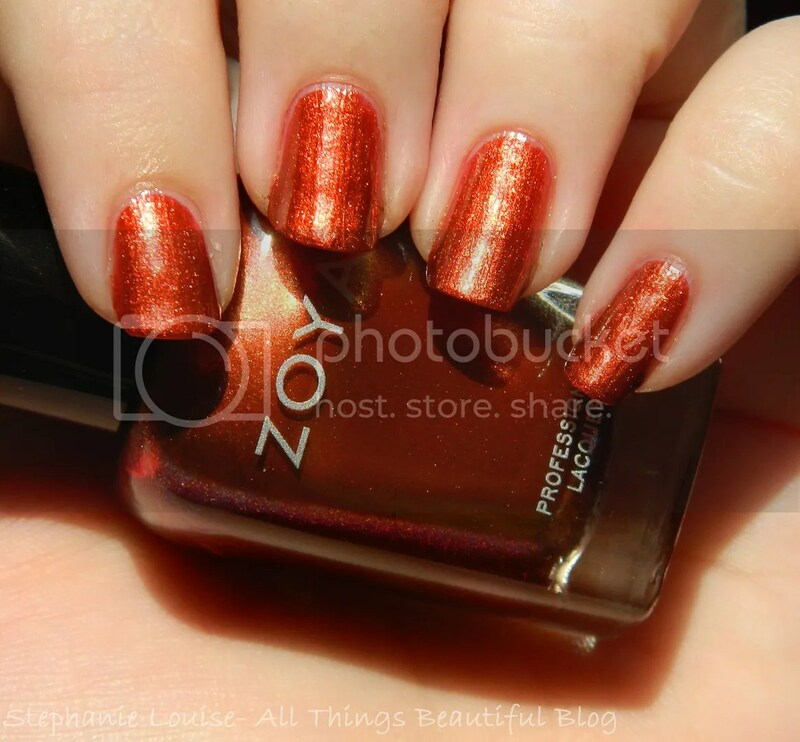 Zoya Channing- a rusty or coppery red metallic. 2 coats. This is the perfect fall shade, a rusty orange metallic with hints of red in the base. Fabulously fall like metallic fall leaves. It is very metallic as well, a real light catcher. Zoya Neve- a sapphire blue metallic. 2 coats. I think this shade is way more complex than described! I see a sapphire blue with an indigo tone so it looks slightly purple-y. The shimmer is fabulous as well with micro shimmer in lots of colors. 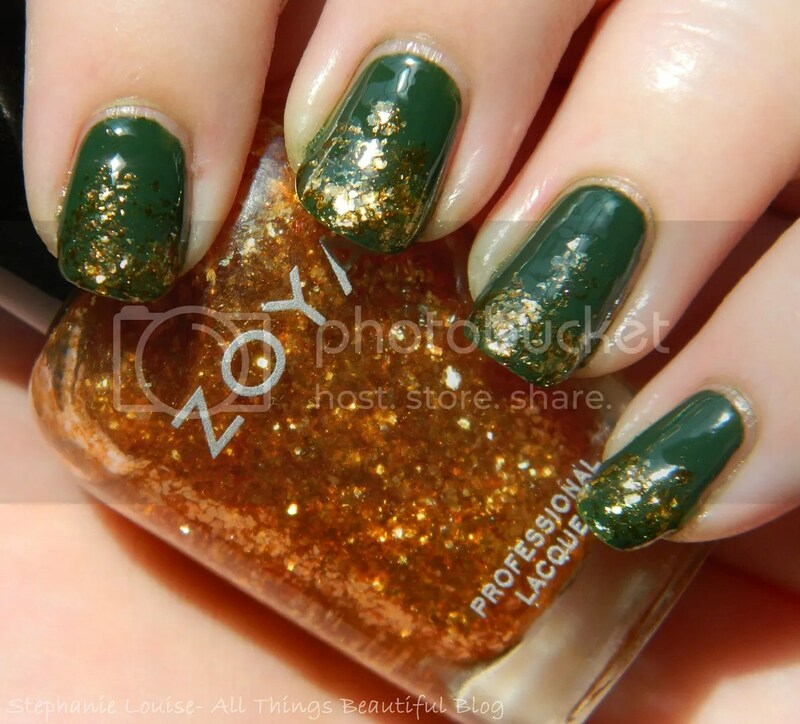 Zoya Maria Luisa- a gold cellophane accent topper. Seen above is 2 thin coats over Zoya Giovanna & a tip gradient over Hunter. I don’t have anything like this gold glitter at all, cellophane is the perfect explanation. These glitters lay completely flat so you won’t need a crazy topcoat. This would also be a brilliant sponging shade. Zoya Claudine- a striking dark meteorite gray metallic. This is the only shade I trusted with one coat! A beautiful gray metallic with olive undertones. Completely unique in my collection. I love grays, especially in fall, & with a green tone? Fab. Zoya Mason- an exciting red violet or “Fandango Pink” metallic. If you’ve been following my blog then you know I’m a HUGE fan of purples but you don’t see many pinks. I absolutely love this shade! It is metallic, 2 coats opaque, & super sparkly. I see bits & pieces of purple in the sunlight which makes it look really ethereal. It is brighter than most plums/pinks I see during fall & looks like jewels. A very strong fall collection for me, different but still feels crisp like fall. I love Mason & Claudine especially which I would have never guessed! My husband really likes Giovanna & refers it as “mermaid green” for reference haha. Each shade is really beautiful, perfect for solid manicures, tips, & nail art. Maria Luisa is also a wonderful addition, I don’t have a gold topper that looks similar! I’m quite happy with each shade individually & as a whole. When I review the Cashmere set I think you’ll find them cohesive together as well! 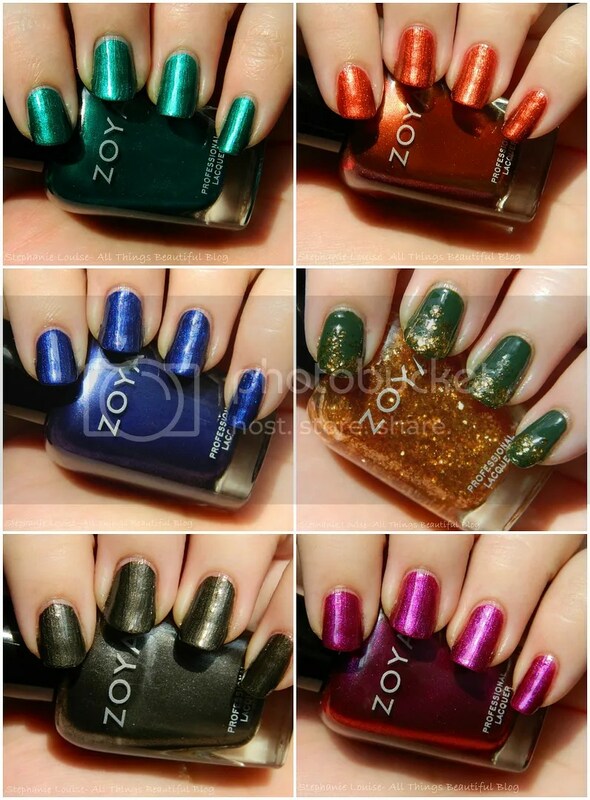 You can purchase these shades & other Zoya products from Zoya.com. I’d appreciate it if you use my share the love link! What shades are you most excited about? Any colors you want to see compared? I already have some in mind but I’d love to hear what you come up with! I’d also love to hear of any fall nail art you’re interested in seeing!